Guishan Dist, Taoyuan City, 33302 Taiwan. Chronic consumption of the N-methyl-D-aspartate (NMDA) receptor antagonist ketamine (KET) induces positive, negative and cognitive deficits in humans which closely resemble symptoms in schizophrenic patients. Human genetic analyses has revealed that neuregulin 1 (NRG1) and its receptor ErbB are Schizophrenia-related genes in some schizophrenic patients. Male SD rats were injected daily with 30 mg/kg KET for five consecutive days to investigate if the KET-induced behavioral abnormality was linked with an alternation of brain NRG1. The KET-treated rats exhibited locomotor/stereotypy up-regulation and a defect in sensorimotor gating, resembling the behavioral phenotype of schizophrenia. Antipsychotics were administered to KET-treated rats to pharmacologically validate this animal model. Clozapine, but not haloperidol or sulpride rescued pre-pulse inhibition (PPI) dysfunction only when coadministered with KET and not following pre-treatment with KET. NRG1 protein levels were progressively decreased in the medial prefrontal cortex, but not the ventral striatum of KETtreated rats during the withdrawal period of up to two weeks. On the other hand, ErbB2, ErbB3 and ErbB4 levels were unchanged in these two brain areas. These results suggest that KETinduced schizophrenia-like symptoms might be linked with abnormal NRG1 expression in the medial prefrontal cortex. Schizophrenia is a brain disease manifest by a distortion of reality and cognitive and affective disturbances. It occurs in about 1% of the human population . Schizophrenia affects several behavioral domains that present as positive symptoms (delusions, hallucinations, and thought disorder), negative symptoms (blunted emotion, emotional detachment, apathy and social incompetence) and cognitive symptoms (impairment of attention, memory, and executive functions) [2,3]. Although the dominant hypothesis centers on disturbed mesolimbic/mesocortical dopamine metabolism, participation of other neurotransmitters such as glutamate, GABA, and serotonin may be involved [4,5]. The dopamine hypothesis might explain the positive symptoms of schizophrenia, but the association between glutamate and schizophrenia is supported by the fact that phencyclidine (PCP) and KET act as potent noncompetitive N-methyl-D-aspartate (NMDA) receptor antagonists to induce a full spectrum of schizophrenic-like symptoms in drug abusers [6,7]. A significant decrease in glutamate levels has been identified in cerebrospinal fluid and in brains of post-mortem schizophrenic patients . Due to its action as an NMDA receptor blocker, an alternative hypo-glutamate hypothesis of schizophrenia has been postulated . The prefrontal cortex (PFC) is a critical brain structure in association with mood disorders [10,11]. There is enriched dopamine and glutamate innervation in the PFC. Their interaction in the PFC is not only associated with higher order cognitive functions, but is also involved in the pathophysiology of schizophrenia . It is speculated that NMDA receptor antagonism decreases the excitatory drive of inhibitory GABA interneurons, which in turn, increases the cortical glutamate and subcortical dopamine efflux [13,14]. Disrupting the inhibitory circuitry induces an unfiltered sensory input that is proposed as responsible for the psychotomimetic action of NMDA antagonists encoding symptoms of schizophrenia [14,15]. Neuregulin (NRG1) may be a schizophrenia candidate gene , though GWAS analysis failed to identify NRG1 as a susceptibility gene . Nevertheless, NRG1-ErbB-PI3KAkt1 dysregulation has strong association with schizophrenia . NRG1 has been implicated in key neuro-developmental processes in the CNS, including neuronal migration and specification, regulation of acetylcholine, GABAA, glutamate receptor expression and oligodendrocyte development [19,20]. NRG1 acts on receptor tyrosine kinases of the ErbB family that includes ErbB2, ErbB3 and ErbB4 . Mutant mice of either NRG1 or its receptor, ErbB4, display a behavioral phenotype that mimics mouse models of schizophrenia . NRG1 defects lead to the reduced expression of myelin and oligodendrocyte-related genes, findings of which are found in schizophrenics . NRG1 heterozygous mice displayed an impaired PPI), a characteristic sensorimotor deficit in several neuropsychiatric diseases [24,25]. Since NRG1- ErbB can functionally associate with the NMDA receptor in the brain , characterizing their interrelationship in different animal models of schizophrenia is essential. Rats chronically treated with (KET) exhibited a schizophrenic behavioral phenotype in association with biochemical alterations in the expression of the NRG1-ErbB system. This KET induced schizophrenia rat model was characterized by behavioral up-regulation, PPI dysfunction, response to clozapine treatment and a decrease in NRG1 in the medial prefrontal cortex. Male Spraque-Dawley rats weighting 200~250 g (BioLASCo Taiwan Co., Ltd) were used. After arrival, they were acclimatized in a room kept at 22 ± 2°C, with 50 ± 10 % humidity and a 12 hour day-night cycle (light on at 7:00 AM) for at least 7 days before experimentation. The rats were housed 2 or 3 per cage (total weights less 1 kg in one cage) and were provided with food (Western Lab 7001, Orange, CA, USA) and water ad libitum. The animal handling and drug treatment were in strict accordance with the NIH Guide for the Care and Use of Laboratory Animals, and the procedure was approved by the Animal Care Committee at the Institute. Rats were randomly assigned to either the chronic saline or chronic KET groups. They received either saline (0.9 % NaCl solution, i.p.) or KET (30 mg/kg in saline, i.p., Sigma) once daily for 5 consecutive days. Animals were treated with either the typical anti-psychotic drugs, haloperidol (1 mg/kg, i.p., RBI) or sulpride (25 mg/kg, i.p., Sigma) or the atypical anti-psychotic drug, clozapine (5 mg/kg, i.p., Sigma). These drugs were given either 30 min prior to daily KET treatment (co-administration) or 14 days after the last KET treatment (post-treatment). The basal and drug-induced locomotor and stereotypic behaviors in rats were recorded in an Animal Activity cage (ENV-520, MED, Associates Inc., St Albans, VT) using an infrared beam detector in an acoustically insulated room. Each rat was accommodated in the chamber (30×45×45 cm3) for a period of 30 min prior to daily drug administration. Immediately after the KET or saline injection, the occurrence of horizontal locomotion (amount of bin crossovers) and stereotypic behaviors (including sniffing, nodding, grooming, and standing) were individually recorded every 5 min for a total behavior session of 2 hours. All the PPI tests took place in a startle chamber (San Diego Instruments, San Diego, CA) and the acoustic startle response (ASR) of each rat was measured 2 hours after the last drug (KET or anti-psychotics) treatment. The session was designed as follows: Rats were placed in the test environment and remained there for 30 min, before the onset of testing. A background noise (a 65-dB broadband noise) was set for 5 min of habituation and then continued throughout the remainder of the test session. The session included 60 trials lasting 20 min. The interval between two trials ranged from 7~23 sec (an average inter-trial-interval was 15 sec). Data were recorded once every millisecond for a total of 100 ms following the onset of the startling stimulus. Six trial types were presented: a 40 ms broadband 120-dB burst (pulse-alone); three pre-pulse + pulse trials in which 20-ms-long 69-dB, 73-dB, 77-dB, or 81-dB (4, 8, 12, and 16 dB above background) stimuli preceded the 120-dB pulse by 100 ms (onset to onset); and a no-stimulus trial. All the trials were presented in a pseudo-randomized sequence. The six trial types were of equal time. PPI is defined as the percentage reduction of the startle magnitude in the presence of the pre-pulse compared to that in the absence of the pre-pulse [100 × (magnitude of the pulse alone trial-magnitude of the prepulse + pulse trial)/ magnitude of the pulse alone trial]. Startle amplitude is the mean magnitude of the pulse alone trials. In this experiment, groups of saline-, KET- or antipsychotic-treated rats were used. The animals were sacrificed by decapitation 2 hours after the behavioral test or at designated KET withdrawal times. Tissues from the medial prefrontal cortex (include prelimbic, infralimbic and anterior cingulate cortex) and ventral striatum (mainly the nucleus accumbens) were quickly dissected and immediately frozen in liquid nitrogen. The tissues were sonicated in 1 % sodium dodecyl sulfate (SDS) and boiled for 5 min. The protein concentration was detected by the Coomassie blue assay using bovine serum albumin as the standard. Equal amounts of protein (20~40 μg) were separated by SDSpolyacrylamide gel electrophoresis (SDS-PAGE) (7.5 or 10 % polyacrylamide gel), and transferred onto the PVDF membranes (Millipore, Bedford, MA). Membranes were blocked with 5 % nonfat milk and then incubated overnight at 4°C with their primary antibodies, which were diluted in the TBS-T (Tris-buffered saline plus 0.1 % Tween-20) buffer. The antibodies used were anti-neuregulin (1:2000), anti-ErbB2 (1:1000), anti-ErbB3 (1:1000), and anti-ErbB4 (1:1000) antibodies (Santa Cruz Biotechnology, CA, USA). After three 10 min washes in TBST buffer, the blots were incubated for 1h at room temperature with horseradish peroxidaseconjugated secondary antibodies in TBST buffer: 1:2000 goat anti-rabbit IgG (Santa Cruz Biotechology, CA, USA) for Neuregulin; 1:1000 goat anti-rabbit IgG (Santa Cruz Biotechology, CA, USA) for ErbB2, ErbB3, and ErbB4. These blots were washed three times for 10 min in TBST and developed for 1 min using the enhanced chemiluminescence (ECL) procedure of Santa Cruz Biotechnology or 5 min using the immobilonTM western chemiluminescent HRP substrate (Millipore, Bedford, MA) and exposed to Hyperfilm (Kodak, X-OMAT). These blots were stripped and re-probed with anti-actin (1:1000; Sigma Co., St Louis, Mo) antibody for quantitative control. The signals on Hyperfilm were scanned, normalized with β-actin and quantified by laser scanning densitometry (Molecular Dynamics) assisted by Image-J software. All the data were analyzed with the program GraphPad PrismTM. Results were expressed as the mean ± SEM. The neurochemical and behavioral data were analyzed with an unpaired Student’s t-test (startle amplitude), one-way analysis of variance (one-way repeated measure ANOVA; motor activity and PPI) or two-way repeated measure ANOVA (PPI with antipsychotics) followed by the post-hoc Tukey’s multiple comparison test. The value P<0.05 was considered significant. KET-treated rats (30 mg/kg i.p. x 5 days) underwent horizontal locomotion and stereotypy (Figure 1A and 1B). Behavioral up-regulation was evident from the increasing intensity of cumulative locomotor activity and stereotypy. Locomotion and stereotypy reached maximal levels on day 4 and exhibited a decrease on day 5. Locomotor activity and stereotypy in the saline-treated group remained at similar basal levels during the course of 5 injection days, hence was pooled. PPI measurements were done to determine if KET treatment would disrupt sensorimotor gating. KET-treated rats (30 mg/ kg i.p. x 5 days) exhibited a decrease in the percent of PPI as compared to the saline-treated controls (Figure 2A). No change was observed in the startle amplitude (Figure 2B). 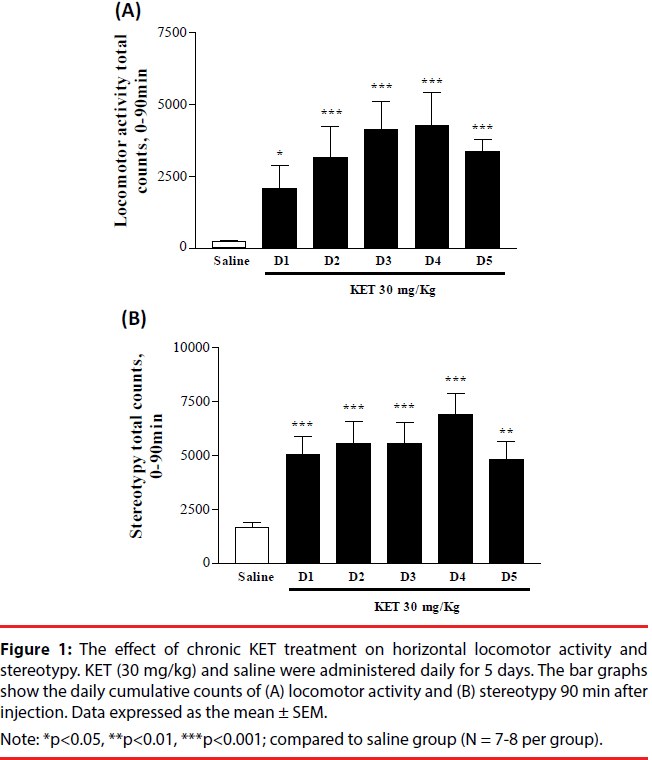 Figure 1: The effect of chronic KET treatment on horizontal locomotor activity and stereotypy. KET (30 mg/kg) and saline were administered daily for 5 days. The bar graphs show the daily cumulative counts of (A) locomotor activity and (B) stereotypy 90 min after injection. Data expressed as the mean ± SEM. Note: *p<0.05, **p<0.01, ***p<0.001; compared to saline group (N = 7-8 per group). Figure 2: The effect of chronic KET treatment on (A) pre-pulse inhibition (PPI) and (B) startle amplitude (in arbitrary units). KET (30 mg/kg) and saline were administered daily for 5 days. The PPI tests were measured at withdrawal days 12~14. PPI % indicates the percentage of startle inhibition. Data expressed as the mean ± SEM. Co-administration with clozapine reversed the effect of KET-induced PPI dysfunction, especially at the 69-77 dB range (Figure 3A). When clozapine was administered 14 days after KET treatment, the PPI response was similar to the saline-treated group at 69, 73 and 81 dB (p>0.05). The startle amplitude among the clozapine and KET treated groups was similar (Figure 3B). Neither haloperidol nor sulpride rescued KET-induced PPI dysfunction in either the co-administration or post-treatment groups (data not shown). Figure 3: The effect of KET and clozapine on (A) pre-pulse inhibition (PPI) and (B) startle amplitude (in arbitrary units). Rats were divided into four groups i.e. a saline-treated group, a KET-treated group, clozapine and KET co-administered group (Cloz+KET), and clozapine post-treated group after KET treatment (KET+Cloz). Ketamine (30 mg/kg) and saline were administered daily for 5 days. Clozapine (5 mg/kg) were injected either 30 min prior to daily KET or 14 days after the last KET injection. The PPI tests were measured after KET withdrawal for 14 days. Data expressed as the mean ± SEM. Note: **p<0.01, compared to saline; N =4-14 per group. NRG1 and its corresponding receptors, ErbB2, ErbB3 and ErbB4 levels were determined in the medial PFC and ventral striatum at various times after KET treatment to establish if behavioral upregulation was correlated with the expression of these receptors. 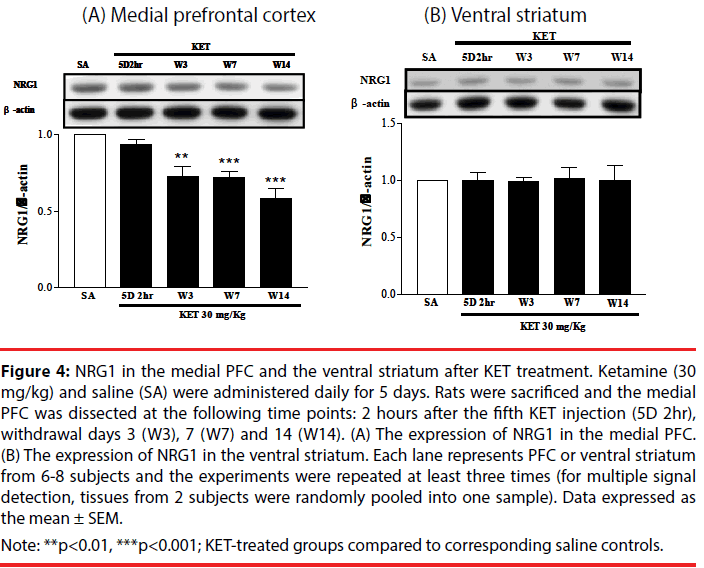 NRG1 in the medial prefrontal cortex progressively decreased (Figure 4A), while NRG1 in the ventral striatum remained constant (Figure 4B) following KET withdrawal for up to 2 weeks as compared to saline controls. 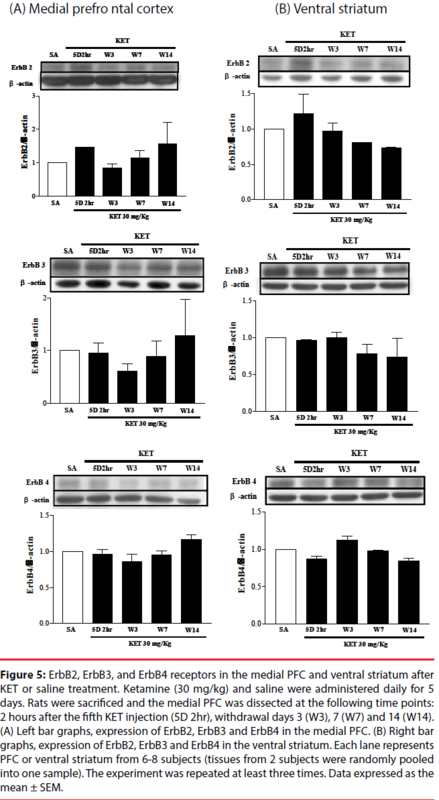 No difference in the expression of the ErbB2, ErbB3 or ErbB4 receptors was found in either the medial PFC (Figure 5A) or ventral striatum (Figure 5B) after KET withdrawal as compared to saline controls. Figure 4: NRG1 in the medial PFC and the ventral striatum after KET treatment. Ketamine (30 mg/kg) and saline (SA) were administered daily for 5 days. Rats were sacrificed and the medial PFC was dissected at the following time points: 2 hours after the fifth KET injection (5D 2hr), withdrawal days 3 (W3), 7 (W7) and 14 (W14). (A) The expression of NRG1 in the medial PFC. (B) The expression of NRG1 in the ventral striatum. Each lane represents PFC or ventral striatum from 6-8 subjects and the experiments were repeated at least three times (for multiple signal detection, tissues from 2 subjects were randomly pooled into one sample). Data expressed as the mean ± SEM. Note: **p<0.01, ***p<0.001; KET-treated groups compared to corresponding saline controls. Figure 5: ErbB2, ErbB3, and ErbB4 receptors in the medial PFC and ventral striatum after KET or saline treatment. Ketamine (30 mg/kg) and saline were administered daily for 5 days. Rats were sacrificed and the medial PFC was dissected at the following time points: 2 hours after the fifth KET injection (5D 2hr), withdrawal days 3 (W3), 7 (W7) and 14 (W14). (A) Left bar graphs, expression of ErbB2, ErbB3 and ErbB4 in the medial PFC. (B) Right bar graphs, expression of ErbB2, ErbB3 and ErbB4 in the ventral striatum. Each lane represents PFC or ventral striatum from 6-8 subjects (tissues from 2 subjects were randomly pooled into one sample). The experiment was repeated at least three times. Data expressed as the mean ± SEM. A KET rat model with hyper-locomotion and a defect in sensorimotor gating was validated. Two typical and one atypical anti-psychotic were studied to substantiate the effect on KETinduced PPI dysfunction. It was found that the atypical anti-psychotic, clozapine, rescued the PPI loss but not haloperidol and sulpride. Clozapine was effective only when it was coadministered with KET, but not after the withdrawal of KET for 2 weeks. The expression of the schizophrenia related gene NRG1 in the medial PFC decreased following KET withdrawal for up to 2 weeks. This suggests that NRG1 in the medial PFC might contribute to the KET-induced schizophrenia-like behaviors in rats. Animal models of schizophrenia induced by PCP or amphetamine display increases in both locomotion and stereotypic behaviors, which have been associated with the positive symptoms of schizophrenia . These behaviors have also occurred following a sub-anesthetic dose of KET (30 mg/kg, i.p.) in rodents , which correlates with an enhanced dopamine release in the ventral striatum. This may reflect a status of “natural sensitization” of the dopamine system that has been observed in patients with schizophrenia . In this study, KET treatment induced behavioral sensitization based on both the locomotion and stereotypy behavioral paradigms. That the locomotor activity decreased by the 5th injection day indicates that KET treatment reached optimal behavioral enhancement or alternatively, it caused tolerance. The results confirm the previous studies  and infer that KET treatment simulates persistent positive symptoms of schizophrenia. The PPI test is a standard test for sensorimotor gating and the PPI of startle can be modulated by a vast array of brain regions including hippocampus, prefrontal cortex, basolateral amygdale, nucleus accumbens, pedunculopontine nucleus, superior colliculus, and inferior colliculus [31,32]. Schizophrenic patients have an impairment in sensorimotor gating and fail to show a PPI on the startle reflex [25,33]. The PPI response is similarly impaired in rodents following treatment with the NMDA receptor antagonists PCP, MK- 801 or KET [34,35]. KET-induced impairment in sensorimotor gating was observed at the 5th injection day of KET (data not shown) and lasted up to 14 days after KET withdrawal. This dysfunction was recovered by treatment with the co-administration of clozapine and KET, lending support to the notion that chronic KET treatment may serve as a plausible schizophrenic animal model. These results are consistent with previous study  that indicate that the atypical anti-psychotic clozapine could manage the KETinduced negative symptoms when compared to typical antipsychotics, haloperidol and sulpride. The inability of the post-treatment of clozapine on KET-induced PPI dysfunction suggests that a more vigorous drug treatment schedule is required. There were inconsistencies in the results regarding alteration of NRG1- ErbB expression in the postmortem brain or those of brains of animal models of schizophrenia. mRNA levels of the three major isoforms of NRG1, i.e. type I, type II and type III are significantly decreased in the dorsolateral prefrontal cortex (DLPFC) of postmortem schizophrenic patients . Alternatively, type I expression in the DLPFC normalized by GAPDH is increased by 23% in patients with schizophrenia . The level of ErbB3 expression is reduced (58% of the control) in the PFC of humans with chronic schizophrenia . No change in the amount of NRG1 and ErbB4 has been reported in PFC of postmortem schizophrenic patients, though NRG1-ErbB4 signaling is significantly enhanced . Mutant mice, heterozygous for NRG1 or ErbB4, exhibit behavioral phenotypes that are similar to schizophrenic patients [16,39,40]. Chronic MK-801 treatment increases NRG1 and ErbB4 in both the PFC and hippocampus of a rat schizophrenia model . In another rat schizophrenia model, maternal injection of PolyI:C enhances mRNA expression at P30 of offspring ErbB4 in the forebrain, but decreases NRG1 mRNA at P60 . Comparable to an acute sub-anesthetic dose of KET (10 mg/kg) that causes a decrease in rat PFC NRG1 , NRG1 in the rat medial PFC was decreased following KET withdrawal for up to 2 weeks. This finding is specific to this brain region, since levels of NRG1 in the ventral striatum remained constant with different KET withdrawal times. NRG1 is implicated in the neurodevelopment and regulation of the expression of glutamate receptors [19,44]. NMDA receptor blockade by KET might trigger the decrease of NRG1 in the medial PFC. The amount of PFC NRG1 after clozapine treatment was not examined in this study, however, it has been found that clozapine up-regulates NRG- 1 gene expression in human neural culture . ErbB2, ErbB3, and ErbB4 were not significantly different between the KET- and saline-treated groups in the medial PFC and ventral striatum. This suggests that the KETinduced schizophrenia model affects NRG1 in the medial PFC, rather than its post-synaptic ErbB receptors. The discrepancies among previous animal studies, including this study might result from different methods used to induce schizophrenia (maternal immune activation, different NMDA antagonists), the drug treatment paradigm or animal per se (genetically modified mice vs. drug-treated rats). Correlative behavioral and biochemical alterations were found in selected paradigms that might be used as valid markers to simulate symptoms of schizophrenia. The significance of the current study is in linking the changes of human genetically identified NRG1 with the KET-treated rat model that mimics schizophrenia, suggesting that alterations in NMDA/DA and NRG1/ErbB must be taken into account when considering the biochemical mechanism in the etiology of schizophrenia. Authors thank Dr. Arnold Stern of New York University for English edition. The work was supported by Chang Gung Memorial Hospital (CMRPD1D0293); Chang Gung University Healthy Ageing Research Center (EMRPD1F0251); and Ministry of Science and Technology (MOST104- 2320-B-182-009), Taiwan. van Os, Rutten BPF, Poulton R. Gene-Environment interactions in schizophrenia: review of epidemiological findings and future directions. Schizo. Bull 34, 1066-1082 (2008). Bouli M, Caldiroli A, Cumerlato MC, et al. Biological aspects and candidate biomarkers for psychotic bipolar disorder: a systematic review. Psychiat. Clin. Neurosci. 12386 (2016). Tsai G, Coyle JT. Glutamatergic mechanisms in schizophrenia. Annu. Rev. Pharmacol. Toxicol. 42, 165-179 (2002). Yamamoto K, Hornykiewicz O. Proposal for a noradrenaline hypothesis of schizophrenia. Prog. Neuropsychopharmacol. Biol. Psychiatry 28, 913-922 (2004). Frohlich J, Van Horn Reviewing the ketamine model of schizophrenia. J. Psychopharmacol 28, 287-302 (2014). Pietraszek M. Significance of dysfunctional glutamatergic transmission for the development of psychotic symptoms. Pol. J. Pharmacol 55, 133-154 (2003). Chavez-Noriega LE, Schaffhauser H, Campbell UC. Metabotropic glutamate receptors: potential drug targets for the treatment of schizophrenia. Curr. Drug. Targets 1, 261-281 (2002). Becker A, Peters B, Schroeder H, et al. Ketamine-induced changes in rat behaviour: A possible animal model of schizophrenia. Biol. Psychiatry 27, 687-700 (2003). Kidd PM. Bipolar disorder and cell membrane dysfunction. Progress toward integrative management. Altern. Med. Rev 9, 107-135 (2004). Penner J, Ford KA, Taylor R, et al. Medial prefrontal and anterior insular connectivity in early schizophrenia and major depressive disorder: a resting functional MRI evaluation of large-scale brain network models. Front. Hum. Neurosci 10, 132-140 (2016). Chatterjee M, Verma R, Ganguly S, et al. Neurochemical and molecular characterization of ketamine-induced experimental psychosis model in mice. Neuropharmacology 63, 1161-1171 (2012). Belujon P, Grace AA. Restoring mood balance in depression: ketamine reverses deficit in dopamine-dependent synaptic plasticity. Biol. Psychiatry 76, 927-936 (2014). Marino MJ, Conn PJ Direct and indirect modulation of the N-methyl D-aspartate receptor. Curr. Drug. Targets 1, 1-16 (2002). Fine R, Zhang J, Stevens HE. Prenatal stress and inhibitory neuron systems: implications for neuropsychiatric disorders. Mol. Psychiatry 19, 641-651 (2014). Stefansson H, Sigurdsson E, Steinthorsdottir V, et al. Neuregulin 1 and susceptibility to schizophrenia. Am. J. Hum. Genet 71(4), 877-892 (2002). Harrison PJ. Recent genetic findings in schizophrenia and their therapeutic relevance. J. Psychopharmacol 29(2), 85-96 (2015). Ray MT, Shannon WC, Webster MJ. Decreased BDNF and TrkB mRNA expression in multiple cortical areas of patients with schizophrenia and mood disorders. Transl. Psychiatry 4, e389 (2014). Corfas G, Roy K, Buxbaum JD. Neuregulin 1-erbB signaling and the molecular/cellular basis of schizophrenia. Nat. Neurosci 7, 575-580 (2004). Lundgaard I, Luzhynskaya A, Stockley JH, et al. Neuregulin and BDNF induce a switch to NMDA receptor-dependent myelination by oligodendrocytes. PLoS. Biol 11, e1001743 (2013). Buonanno A, Fishbach GD. Neuregulin and ErbB receptor signaling pathways in the nervous system. Curr. Opin. Neurobiol 11, 287-296 (2001). Perez-Garcia CG. ErbB4 in Laminated Brain Structures: A Neurodevelopmental Approach to Schizophrenia. Front. Cell. Neurosci 9, 472 (2015). Bennett MR. Schizophrenia: susceptibility genes, dendritic-spine pathology and gray matter loss. Prog. Neurobiol 95, 275-300 (2011). Huang CH, Pei JC, Luo DZ, et al. Investigation of gene effects and epistatic interactions between Akt1 and neuregulin 1 in the regulation of behavioral phenotypes and social functions in genetic mouse models of schizophrenia. Front. Behav. Neurosci 8, 455-462 (2015). Duncan EJ, Madonick SH, Parwani A, et al. Clinical and sensorimotor gating effects of ketamine in normals. Neuropsychopharmacology 25, 72-83 (2001). Hahn CG, Wang HY, Cho DS, et al. Altered neuregulin 1-erbB4 signaling contributes to NMDA receptor hypofunction in schizophrenia. Nat. Med 12, 824-828 (2006). Jodo E. The role of the hippocampo-prefrontal cortex system in phencyclidine-induced psychosis: a model for schizophrenia. J. Physiol. Paris 107, 434-440 (2013). Sumiyoshi T, Tsunoda M, Uehara T, et al. Enhanced locomotor activity in rats with excitotoxic lesions of the entorhinal cortex, a neurodevelopmental animal model of schizophrenia: behavioral and in vivo microdialysis studies. Neurosci. Lett 364, 124-129 (2004). Weidenauer A, Bauer M, Sauerzopf U, et al., Making sense of: sensitization in schizophrenia. Int. J. Neuropsychopharm (2017). Imre G, Fokkema DS, Den Boer JA, et al. Dose-response characteristics of ketamine effect on locomotion, cognitive function and central neuronal activity. Brain Res. Bull 69, 338-345 (2006). Powell CM, Miyakawa T. Schizophrenia-relevant behavioral testing in rodent models: a uniquely human disorder? Biol. Psychiatry 59, 1198-1207 (2006). Swerdlow NR, Geyer MA, Braff DL. Neural circuit regulation of prepulse inhibition of startle in the rat: current knowledge and future challenges. Psychopharmacology (Berl) 156, 194-215 (2001). Swerdlow NR, Bhakta S, Chou HH, et al. Memantine effects on sensorimotor gating and mismatch negativity in patients with chronic psychosis. Neuropsychopharmacology 41, 419-430 (2016). Geyer MA, Krebs-Thomson K, Braff DL, et al. Pharmacological studies of prepulse inhibition models of sensorimotor gating deficits in schizophrenia: a decade in review. Psychopharmacology (Berl) 156, 117-154 (2001). Khella R, Short JL, Malone DT. CB2 receptor agonism reverses MK-801-induced disruptions of prepulse inhibition in mice. Psychopharmacology 231, 3071-3087 (2014). Swerdlow NR, Bakshi V, Waikar M, et al., Seroquel, clozapine and chlorpromazine restore sensorimotor gating in ketamine-treated rats. Psychopharmacology 140, 75-80 (1998). Harris LW, Lockstone HE, Khaitovich P, et al. Gene expression in the prefrontal cortex during adolescence: implications for the onset of schizophrenia. BMC Med. Genomics 2:28-33 (2009). Hashimoto R, Straub RE, Weickert CS, et al. Expression analysis of neuregulin-1 in the dorsolateral prefrontal cortex in schizophrenia. Mol. Psychiatry 9, 299-307 (2004). Chohan TW, Nguyen A, Todd SM, et al. Partial genetic deletion of neuregulin 1 and adolescent stress interact to alter NMDA receptor binding in the medial prefrontal cortex. Front. Behav. Neurosci 8, 298-305 (2014). Pandya CD, Pillai A. TrkB interacts with ErbB4 and regulates NRG1-induced NR2B phosphorylation in cortical neurons before synaptogenesis. Cell. Commun. Signal 12, 47 (2014). Feng Y, Wang XD, Guo CM, et al., Expression of neuregulin 1 and ErbB4 in prefrontal cortex and hippocampus of a rat schizophrenia model induced by chronic MK-801 administration. J. Biomed. Biotech 859516 (2010). Hemmerle AM, Ahlbrand R, Bronson SL, et al., Modulation of schizophrenia-related genes in the forebrain of adolescent and adult rats exposed to maternal immune activation. Schizo. Res 168, 411-420 (2015). Wang N, Zhang GF, Liu XY, et al., Downregulation of neuregulin 1-ErbB4 signaling in parvalbumin interneurons in the rat brain may contribute to the antidepressant properties of ketamine. J. Mol. Neurosci 54, 211-218 (2014). Jaaro-Peled H, Hayashi-Takagi A, Seshadri S, et al. Neurodevelopmental mechanisms of schizophrenia: understanding disturbed postnatal brain maturation through neuregulin-1-ErbB4 and DISC1. Trends Neurosci 32, 485-495 (2009). Chana G, Lucero G, Salaria S, et al., Upregulation of NRG-1 and VAMP-1 in human brain aggregates exposed to clozapine. Schizo. Res 113, 273-276 (2009).